I have been asked by several readers if I know of upcoming events in Italy relating to needlework. Some are busy planning their holidays and wish to incorporate a needlework event or two into their stay in Italy. It's a lovely idea and makes for a memorable time. Abilmente presents their Creativity Fair in Vicenza, March 1 - 4, 2012. This is a big craft fair not just dedicated to needlework. Trecce, Intrecci, Merletti - an exhibition of Braid Embroidery, Cantù Lace and Aemilia Ars Needle Lace at the Villa Smeraldi, 15km outside of Bologna. March 11 - 25, 2012. HobbyShow is big craft fair in Milan, March 16 - 18, 2012. Needlework is included but not the dominant theme of this fair. The International Biennial Lace Exhibition of Sansepolcro will be held September 8 - October 28, 2012. This year's show is dedicated to the Emancipation of Women. Download the program in English and Italian here (click on the words: "Regolamento e bando di concorso"). The Ago Magico show and market will be November 9 - 11, 2012 at the Parco Esposizioni Novegro about 10kms outside of Milan. This show is dedicated to artistic embroidery and sewing. Italia Invita has just announced the dates for the 6th edition of their Textile Creativity Forum which will be located in Parma, May 10, 11, 12, 2013. They haven't announced the theme or events and attractions yet as we're still a little more than a year away from this one, but stay tuned, these things will be forthcoming soon. That's all that I've got for now. I will post again with any additions that I discover. Please post a comment if you know of an event that I've missed or if you visit any of these events, we'd love to hear about them! 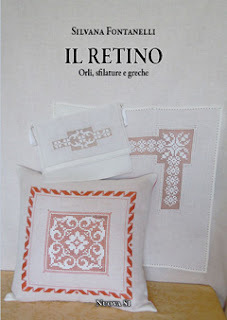 Silvana Fontanelli over at her blog Il Piacere del Ricamo has started a Drawn Thread Work Sampler that you might want to get in on. The author of two books - one of which I've told you about here, Silvana explains with great step-by-step photos how to do some great Italian Drawn Thread Work. Her second book, Il Retino: Orli, Sfilature e Greche is a treasure trove of Drawn Thread Work including techniques on netting. Many of the stitches that she's going over on her blog can be found in this terrific little volume. 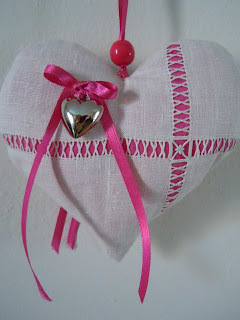 February 7th's post on Silvana's blog is an exquisite little heart with the Gigliuccio hemstitch which my regular readers will know that I absolutely adore. For the rest of the posts about Silvana's Drawn Thread Work Sampler, click on the word: Sfilature to see all the posts, going back to the beginning. You can purchase either of Silvana's books from Tombolo Disegni, send an email to place your order. The ladies of the association "I Merletti di Antonilla Cantelli" have released some more patterns from the boxes that they have from the needlework workshop of Sacro Cuore (early 20th century) in Bologna. This set of presents for us is in celebration of the New Year and features a photo of some of the teachers of the needlework workshop of Sacro Cuore, one of the most talented groups doing Aemilia Ars needle lace at the time. There are 14 pages of patterns to download. The ladies answer your requests for more simple patterns. There are also some anecdotes about some of the historical pieces and people of this beautiful lace including the sad story of Nella Grassini Errera and her husband Paolo, prominent Venetian citizens taken and deported to Auschwitz where they were executed in 1944. If you're like me and can't get enough pictures of Aemilia Ars needle lace, make yourself a cuppa and check out the photos that the Fondazione Cassa di Risparmio of Bologna has published on the Genus Bononiae website. Many patterns from a 17th century book of designs by Bartolomeo Danieli were the inspiration for breathtaking pieces of needle lace made in the early days of the Aemilia Ars Society. The CalcoGRAFICA National Graphics Istitute has recently made some of Danieli's designs available on their website. To download the Christmas presents that the ladies from "I Merletti di Antonilla Cantelli" gave us in December of 2011, click here. 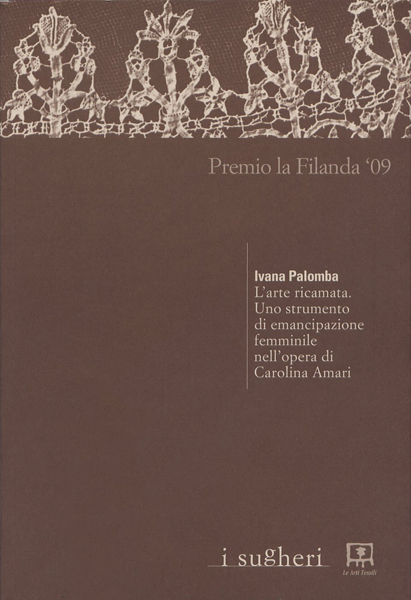 As I mentioned in a previous post, Ivana Palomba has written her thesis for her degree in History and the Protection of Art Heritage on Carolina Amari and her role in needlework and women's emancipation in the early part of the 20th century. The thesis has been published as the volume: L’Arte ricamata. Uno strumento di emancipazione femminile nell’opera di Carolina Amari [Embroidered Art. An instrument of the emancipation of women in the work of Carolina Amari], Le Arti Tessili, 2011. Text in Italian. This is an important work for the history of needlework and is well-documented and researched. There are lots of notes to read and bibliography titles to investigate. 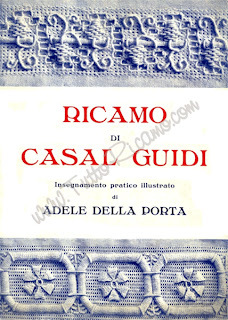 Last year I started to tell you about Casalguidi Embroidery and the Tuscan town it takes its name from so I asked the author if she would mind if I translated some of the chapter on that for you. She generously granted my request so the following is translated from the chapter: Carolina Amari’s Work in Italy and America, sub-heading The Casalguidi School. [...] At the end of the 19th century the little town survived daily, sharing the extreme poverty in which most of the population languished with the neighbouring villages, devoted mainly to agriculture, the manufacture of sorghum brooms and the working of straw. A clear and intense picture of the living conditions of the time, outside of the many historical documents, is given to us by the simplicity of a study done by the grade 5 students of the local elementary school under the guidance of their teacher. If memory, the subject of the study, also takes into consideration the experiences of life some eighty years ago, it could similarly reflect more remote situations, the water which froze in the water jugs of the bedroom washstands in the winter months, the only pair of shoes worn by whoever got up the earliest on Sunday and the doctor, sometimes called too late in order to save on a visit and medications with the risk of paying the priest and for the funeral, while on the poor table bread dominated, its slices were at best flavoured with a piece of herring or lard which hung from the centre of the ceiling. In contrast to all this, to drown the bitterness of a miserable life for most people, the seasons and anniversaries were an occasion to get together, to sing and dance on the threshing floor to the sound of a hurdy gurdy with a good glass of wine. The woman, between the harshness of the fields and family life, stole the time from the long day to make a braid of straw or netted gloves in order to contribute to the meagre family income besides sewing, darning for all the members of her family, as well as embroidering because embroidery gave value to the poorest furnishing and even made a poor sheet seem valuable. 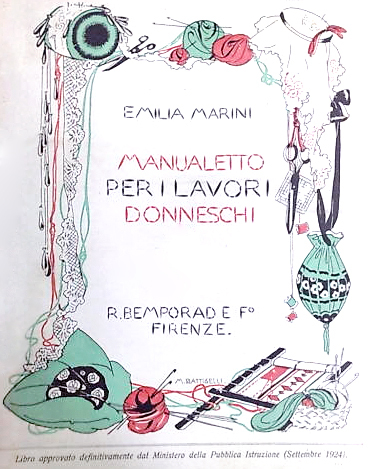 Over time it came to be believed that the creation of an embroidery so artistic was owed to the Morelli sisters in whose workshop, primarily managed by Giuseppina, a number of young girls of the area came together to learn embroidery techniques handed down from generation to generation. Therefore, it is in light of evidence that leads this embroidery back to Amari which raises the question of why Carolina may have made her creation available to the Morelli sisters. The only plausible hypothesis is that, moved by her extraordinary selflessness, she wished to give the women of those lands a unique tool with which they could improve their own living conditions. 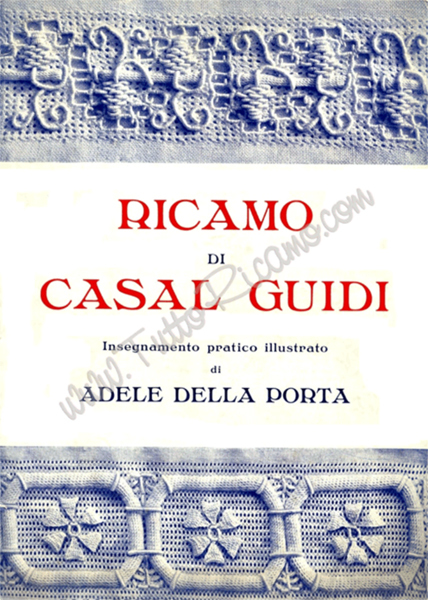 Unfortunately however, any trace of this has been obliterated by time or perhaps by certain situations, only the national and international notoriety of the embroidery called Casalguidi endures to this day. The characteristic of this composite embroidery is given by the lightness of the background which can be drawn-thread or filet and by the almost sculptural relief effect that is made by motifs executed in the stitches: satin, stem, buttonhole, curl and Venetian. The representations recall geometric motifs, sticks inserted into or overlapped by shoots of flowers and leaves, bunches of grapes and by a characteristic six-petaled rosette, everything finished off by precious tassels made with the needle. (Federica Mabellini, Dipinti ad Ago. L’arte del ricamo dalle origini al Punto Pistoia [Painted with the Needle. 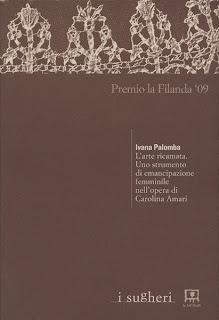 The art of embroidery from its origins to Pistoia Embroidery], Maria Pacini Fazzi Editore, Lucca, 1995). 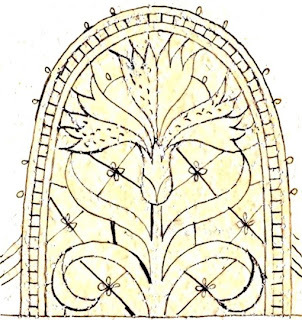 But not only Florence, Pistoia also has sculptural decorations in the San Zeno Cathedral and the Baptistry, the jewels of the churches of Sant’Andrea, San Giovanni Fuorcivitas and San Piero Maggiore were all models for this embroidery. The work made with this technique had considerable success in various exhibitions and Elisa Ricci, speaking about the works from the various cities of Italy sent to the World’s Fair in Milan in 1906, unfortunately destroyed, besides the well-known names, lists the “many remote villages with names then unknown to all (beautiful Italian names that our works now carry around the whole world!) Pescocostanzo, Anghiari, Pomponesco, Casamassella, Casalguidi,...”, towns which, according to Ricci, in their humility and obscurity all have “in the church or in the city hall or in the old walls, some noble trace in their past.” (Le industrie femminili italiane a Berlino [The Italian Feminine Industries in Berlin] in the magazine, Emporium, Istituto Italiano di arti grafiche, Bergamo, 1909, written under her penname, Aracne). While Sofia Bisi Albini notes: “Florence sent Berlin Casalguidi embroideries in raised white on silk for ordinary applications and other originals, like those curious dish-covers for keeping off the flies.” (L’Esposizione di lavori popolari a Berlino e le Industrie Femminili Italiane [The Exposition of Popular Art in Berlin and the Italian Feminine Industries], in the magazine, Vita femminile italiana, 1909). Or also Virginia Colucci, remembering the many works presented at the Exhibition of Feminine Art in Siena in 1912, regrets not being able to admire the important artifacts of the Casalguidi school but stresses that even modest essays submitted by the public would give an idea of “the originality, the freshness and elegance of those same works.” (Mostra D’arte femminile a Siena [Exhibition of Feminine Art in Siena], in the magazine Vita d’Arte, L. Lazzeri, Siena, 1912). Thank you to Ivana for allowing me to translate this portion of her book. Any errors in the translation are surely mine.